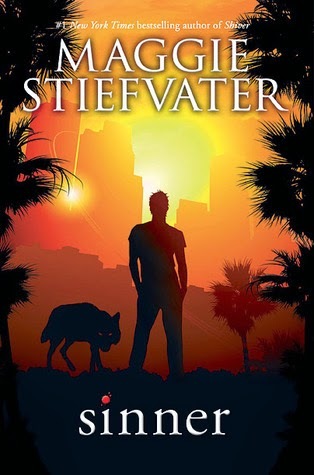 I was beyond thrilled when it was announced that Maggie Stiefvater had written a book about Cole and Isabel. I can remember the exact moment I saw the news on my phone and started squealing out loud, much to the alarm of my family, haha. Cole and Isabel were my favorite characters in the original trilogy, so to say I had big expectations is an understatement. I'm so happy to say that Sinner was amazing! Even better than the trilogy, in my opinion. It's definitely my favorite of Maggie's books. Sinner is a lot different from the first three books in that it's not so much focused on werewolves as it is on the characters of Cole and Isabel. They are both such complex and broken characters. I love that they both have tons of faults - just look at the title of the book, after all - but it's impossible to not love them anyway. And of course, they are amazing as a couple too. Cole and Isabel both fight a lot, have tons of issues to work through, and have dark pasts, but underneath it all they are deeply in love with each other. It's a beautiful romance that's impossible to forget. As I mentioned above, the plot doesn't focus much on the werewolf aspect. It's touched upon briefly and comes into play during a few scenes, but this is really more of a contemporary novel. It's about two broken people who are trying to find themselves, and in doing so find their way back to each other. And as always, I'm still just astounded at the writing. Maggie writes some of the most gorgeous prose ever. I usually only highlight a few passages here and there when I read a book on my Kindle, but I was highlighting like crazy while reading Sinner! There were so many profound quotes and amazing little lines and achingly beautiful descriptions. It's a treat to read a book that is full of such detailed writing in every aspect - the setting, the characters, the storyline. I loved it. If you're a Maggie Stiefvater fan, there's no doubt in my mind that you're going to love this book. It's perfect in every way, and I'm so happy that Cole and Isabel got their own story and their own happy ending. Filled with lovely writing and irresistible characters, Sinner is one book you don't want to miss.